Shirts With Random Triangles: Is Maty Mauk "modeling his game" after Johnny Manziel a good thing or a bad thing? 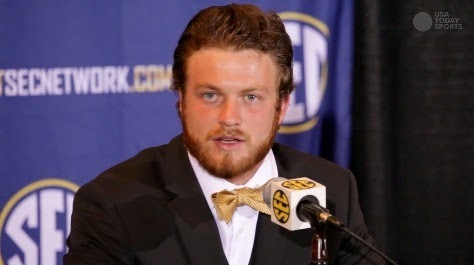 Is Maty Mauk "modeling his game" after Johnny Manziel a good thing or a bad thing? Maty Mauk at SEC Media Days. Photo via USA Today. Today's "Is this a good thing or a bad thing?" item of the day comes from presumed Missouri starting quarterback Maty Mauk, who told reporters attending Mizzou's SEC Media Days session that he modeled his playing style after former Texas A&M starting QB Johnny Manziel. "He's somebody that I want to — not necessarily be like — but I can model my game after him," Mauk said at SEC Media Days on Wednesday. "He can change a game so quick by being able to make plays, and that's something I feel like I can do and something I have to do. "He's someone that I can look to. I watch him on film all the time. He was a great player and someone I'm going to try to play like." The words "not necessarily be like" are probably a sigh of relief to Missouri head coach Gary Pinkel, who could probably do without the headaches Manziel gave Texas A&M head coach Kevin Sumlin. The bad news for Pinkel is that Mauk has shown some of off-the-field behaviors that made JFF as (in)famous as his on-the-field pyrotechnics. On the other hand, Mauk has been compared to Manziel before, and in not the good way. Last year Busted Coverage called Mauk "The Next Johnny Football," and not because of his on the field abilities. 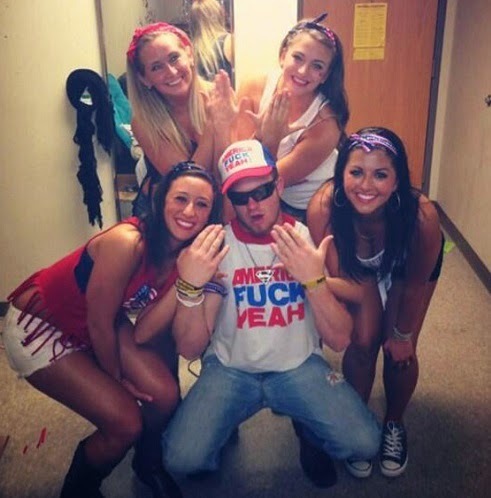 The website posted a photo of Mauk wearing a pair of jorts and an "America F**k Yeah!" sleeveless t-shirt. Here's a pic of the t-shirt, sans jorts. Photo via Larry Brown Sports. Busted Coverage also mentioned Mauk's "Driving while Georgia" arrest as a freshman on misdemeanor charges of leaving the scene of an accident involving a motor scooter. Mind you, Mauk isn't quite ready to go the Full Monty as heir apparent to Manziel.
.@MIZ_MAUK7_ZOU: "I'm not Maty Football. I'm Maty Mauk. I'll make my own name." I guess we'll have to come up with some other name for Mauk. And no, "Maty Ice" is not acceptable. Mauk was thrown into the fire last season when he was called to replace the injured then-Mizzou starting QB James Franklin in the 2014 Missouri-Georgia game on Oct. 12. The Tigers went on to beat the Bulldogs 41-26. Mauk went on to start in the next four games, facing Florida, South Carolina, Tennessee and Kentucky. The Tigers went 3-1 in that stretch, losing only to the Gamecocks in a 27-24 overtime loss. If Mauk can manage to tone down his previous indiscretions, he could find himself in the running for a Heisman in the next two or three years.